Not counting last year's Cape Cod marathon relay in Falmouth where I ran 9 miles across two non-consecutive legs, I established a personal distance record on today's run. Unlike Falmouth, today was an uninterrupted run that covered over eight miles in an hour and fourteen minutes. I'd made the decision not to run this morning's RXR 10K and, perhaps out of guilt for not racing, I decided to do a long distance run on my own. In order to break out of my usual 5-6 mile doldrums that have been standing in as my long weekend runs over the last couple of months, I knew that needed to leave the neighborhood to help frame out a longer run. I headed to Bethpage State Park and paid my fee at the gate. I tried to buy an Empire Passport on the spot but they only accepted a check or cash and I only had a little cash and some credit cards. I began my run at the end of the bike trail and immediately met the sharp but mercifully short initial hill. Once level I knew that I'd enjoy a long downhill at the half mile mark. The enjoyment was bittersweet because I knew I'd need to climb that long hill upon my return when I would be depleted from an hour-plus of running. I followed the trail for four miles and passed a number of runners and walkers and winced each time a cyclist whizzed by from behind a little too close for comfort. At one point two cyclists, who were riding side by side, came toward me and would have run me off the path but I stood my ground. Unfortunately for the closer rider, the end of my elbow struck his arm and produced a yelp. I apologized by yelling "share the road!" I think they learned their lesson. At least they didn't come after me. A funny thing about the Bethpage bike trail is that it often gives the illusion that you are running uphill even when you're not. As I made my way for the 4 mile out segment I kept thinking how I'd enjoy the downhill side of the hills I was encountering. I turned around shortly after crossing the overpass to the Southern State Parkway and was dismayed as I headed back for the second 4 miles that the path seemed to run uphill. I still had plenty of energy at the midpoint so the hills were easily met but in the back of my mind I was dreading the long uphill stretch I'd encounter between miles 7 and 8. I caught and passed a few more runners and walkers and monitored my Garmin to make sure my heart rate was staying within range. I managed to keep my pace around 9:00 per mile for most of my run but by mile seven I slowed down to the mid-9:00 range, especially on the run-ending hills. The only time I questioned whether I could finish what would be a personal best for distance was leading up the big final hill. When I got there I just dug in, took smaller steps and hoped it would soon be over. In the end I covered 8.15 miles and when I looked at the run summary on the Garmin I saw that I'd expended exactly 1,000 calories over the course of my run. 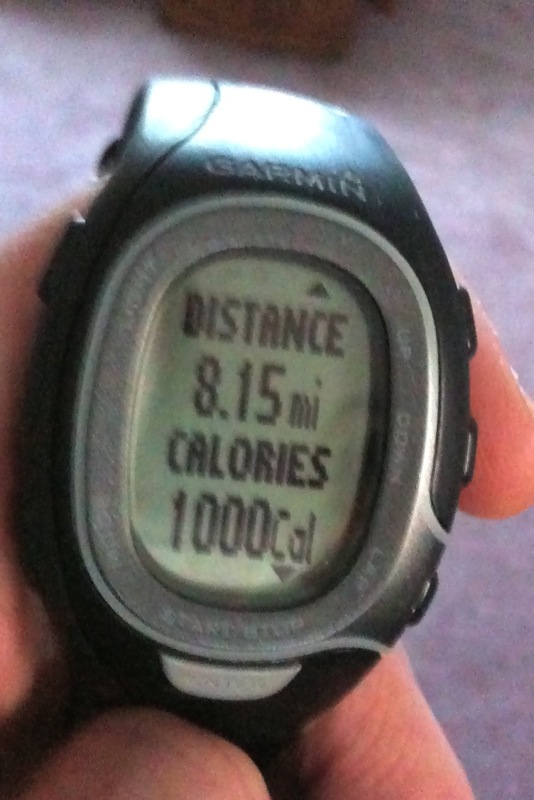 I'm pleased that I've broken the 8 mile single run barrier and I feel better than I thought I would after all that work. Some day I'll run 9 but for today, the record stands at 8.15.